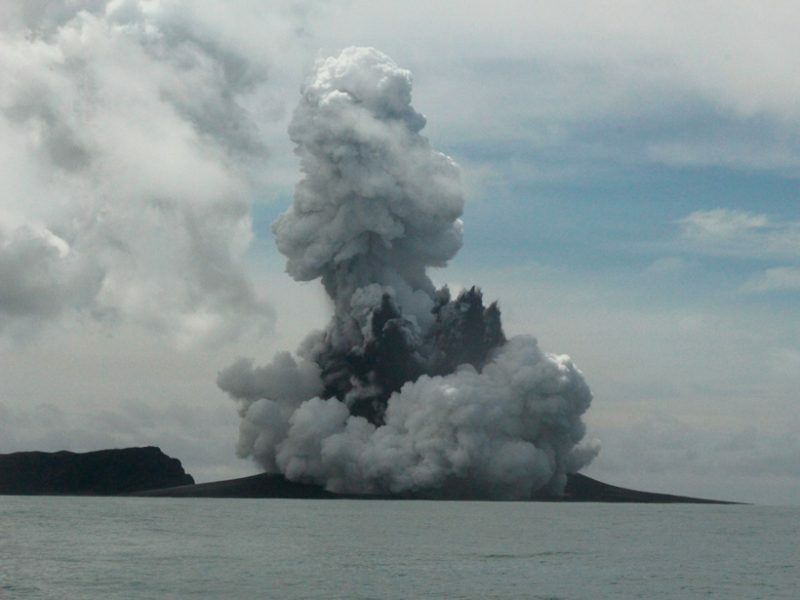 A newly formed volcanic cone between the Tonga islands of Hunga Tonga and Hunga Ha‘apai erupts on 15 January 2015, releasing dense, particle-rich jets from the upper regions and surges of water-rich material around the base. The monthlong Hunga eruption created a new island that is now the subject of study and promises to reveal new aspects of the region’s explosive volcanic past. 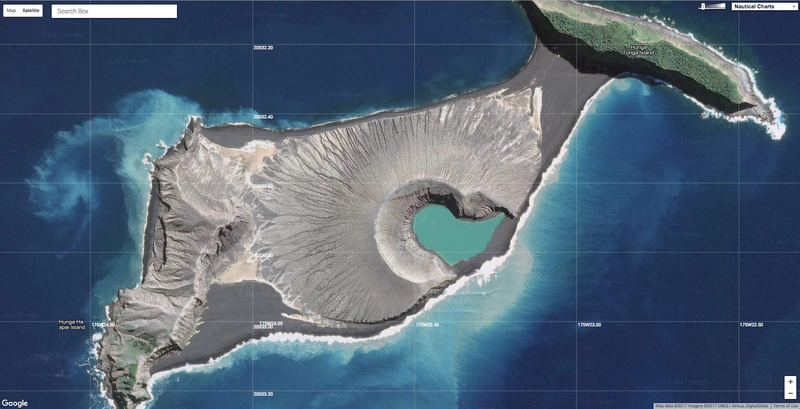 A recent volcanic eruption near Tonga in the southwest Pacific created a new island, giving scientists a rare opportunity to explore the volcanic record of this remote region. In late December 2014, an undersea volcano erupted between two small islands in the Tonga volcanic arc northeast of New Zealand, sending steam and dense ash plumes high into the air. By the time the eruption ended about 5 weeks later, a new island had formed, eventually bridging the gap between the original islands. Winds and ocean waves then began rapidly reshaping the newly emerged volcanic cone. Ten months after the eruption, we visited the new island, which we unofficially nicknamed Hunga Island. 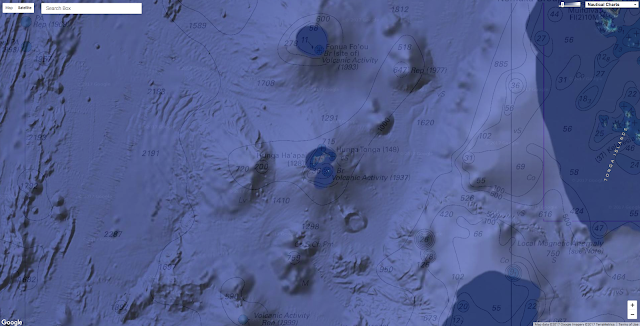 There, we attempted to characterize the volcanology of the eruption, begin tracking the rate of erosion on the new island, and assemble a history of volcanism in this region of the southwest Pacific. Our findings reveal a shallow submarine volcanic caldera adjacent to the new volcanic island, and they highlight how incomplete the volcanic record can be at remote oceanic volcanoes. The uninhabited islands of Hunga Tonga and Hunga Ha‘apai lie 65 kilometers north of Nuku‘alofa, the capital city of the Kingdom of Tonga. Between 19 December 2014 and 28 January 2015, residents of Nuku‘alofa witnessed several large volcanic plumes rising from an eruption in the direction of the two islands [Global Volcanism Program, 2015], as seen in the news video below. Newly awakened Hunga Ha'apai volcano creates large new Tongan island. The plumes were the result of an explosive interaction between seawater and magma rising from a plateau about 150 meters below the ocean surface. The plateau is part of Hunga, a massive, submerged volcanic edifice that rises more than 2000 meters from the surrounding seafloor and the site of volcanic activity as recently as 1988 and 2009 [Global Volcanism Program, 2009]. The 2014–2015 Hunga eruption deposited material between the islands of Hunga Tonga and Hunga Ha‘apai, initially creating an isolated third island before connecting with Hunga Ha‘apai. In less than 3 weeks, the eruption built up a circular area of land with a diameter of about 2 kilometers and a height of 120 meters. 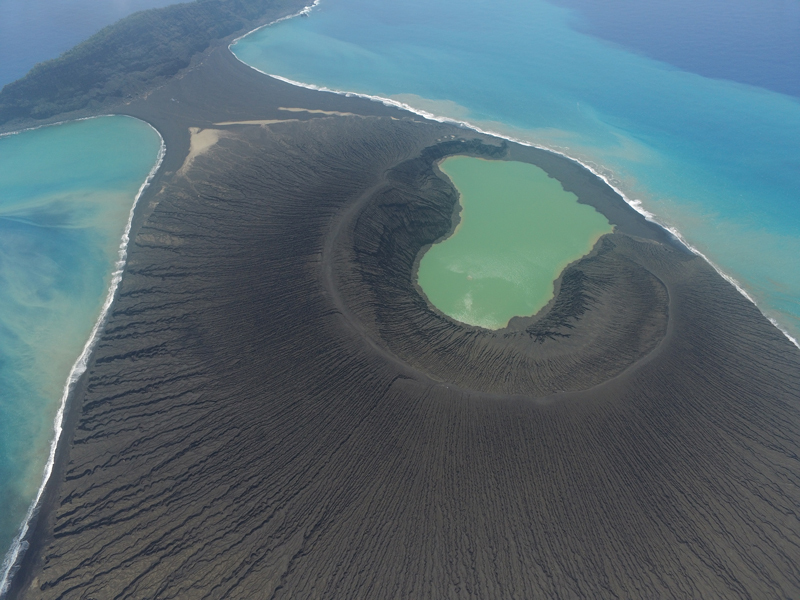 This oblique aerial view shows the new Hunga cone and crater on 6 November 2015, stretching between the islands of Hunga Ha‘apai and Hunga Tonga (top). The crater rim is about 550 meters in diameter. Hunga Ha‘apai, Hunga Tonga, and a reef to their south sit on the rim of a submarine caldera known as Hunga Tonga–Hunga Ha‘apai. The islands and reef are the only surface features betraying the presence of the largely submerged Hunga volcano (Figure 1). Fig. 1. Water depth measurements show the Hunga edifice on which the islands of Hunga Tonga and Hunga Ha‘apai lie. Neighboring volcanoes include the active Metis Shoal. 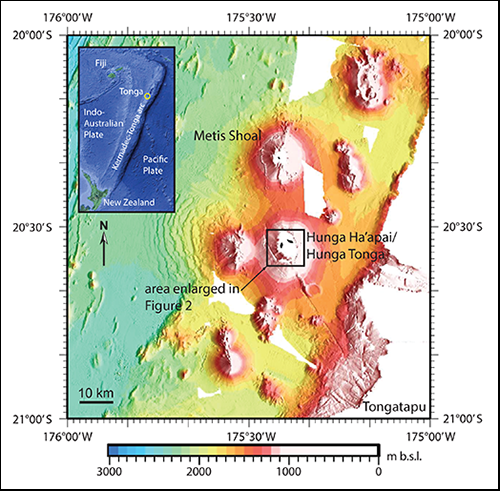 The inset shows the Tonga archipelago’s location within the Kermadec-Tonga volcanic arc at the boundary between the Pacific Plate and the Indo-Australian Plate. Hunga volcano is one of many volcanoes in the Tonga-Kermadec volcanic arc that formed in response to subduction of the Pacific Plate beneath the Indo-Australian Plate. Many highly explosive eruptions along this chain have had significant regional consequences [see, e.g., Caulfield et al., 2011]. These occurrences suggest that Hunga volcano may itself have had a similarly violent past. Past research indicates that radiating, outward dipping lava flows and pyroclastic deposits on the two older Hunga islands represent small remnants of the rim of a very large volcano surrounding a caldera structure [Bryan et al., 1972]. This volcano may have suffered catastrophic collapse or prolonged erosion, obscuring it from view. A nautical chart recently created for Nishinoshima island has fallen behind the growth of the real island. The red curves on the center left of the island, apart from contour lines, indicate the locations of pre-eruption coastlines. In November 2015, we conducted a land and ocean survey of Hunga Tonga–Hunga Ha‘apai and the new island. Our goals were to characterize the recent eruption and collect baseline quantitative topographic data for tracking erosion rates. We also wanted to assemble a longer history of the area’s volcanic and tsunami activity by surveying the older Hunga islands and surrounding shallow waters. On the new island, we discovered that coarse deposits from falling water-rich jets of pyroclastic rock fragments form the lower beds of the cone, consistent with videos and photos of the eruption in progress. Where waves have cut into the shoreline, the pyroclastic deposits appear poorly consolidated and poorly sorted. The upper part of the cone is steeper and reflects a gradual “drying” (decrease in water interaction with magma) of the eruption as it proceeded. This upper region is made up of thin, fine-grained beds of ash deposits, interspersed with ash-dominated sediments typical of lateral currents of particles, air, and steam. The cone reached its maximum diameter by 7 January 2015 but continued to increase in height over the next 2 weeks. Once the vent was completely surrounded by pyroclastic deposits, much higher eruption columns began. Such Surtseyan eruptions—from a shallow sea or lake water—have only rarely been witnessed since the phenomenon was first seen during the formation of Surtsey, Iceland, in 1963 [Kokelaar, 1983]. 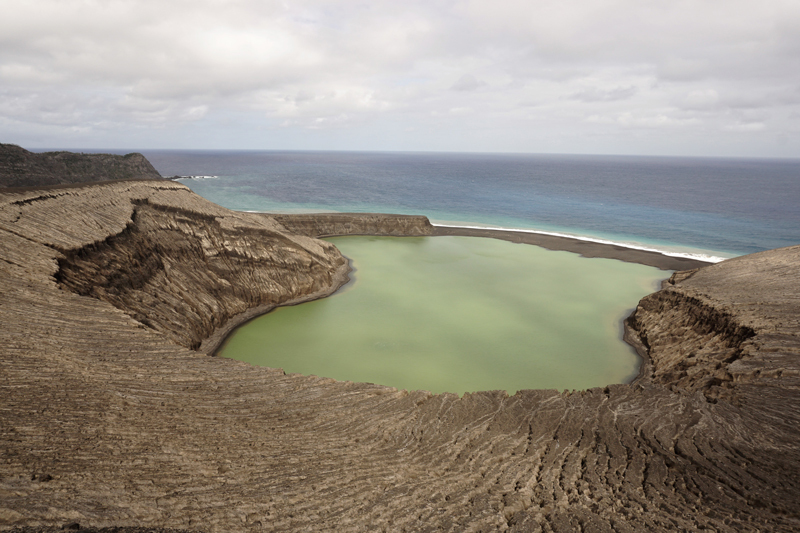 A new crater lake sits atop the Hunga cone, created in the recent eruption between the islands of Hunga Ha‘apai and Hunga Tonga in the Tonga volcanic arc. Rilling of the island’s surface—forming dendritic erosion patterns—started during the cone growth, but it accelerated with rainfall once the eruption ceased. In addition, wave erosion began to rapidly attack the base of the island. Wave erosion was strongest on the southern side of the cone, exposed to the southeast trade winds and associated ocean swells. There, the island has shrunk by more than 500 meters from its initial posteruption shore, leaving 40-meter-high collapsing cliffs. 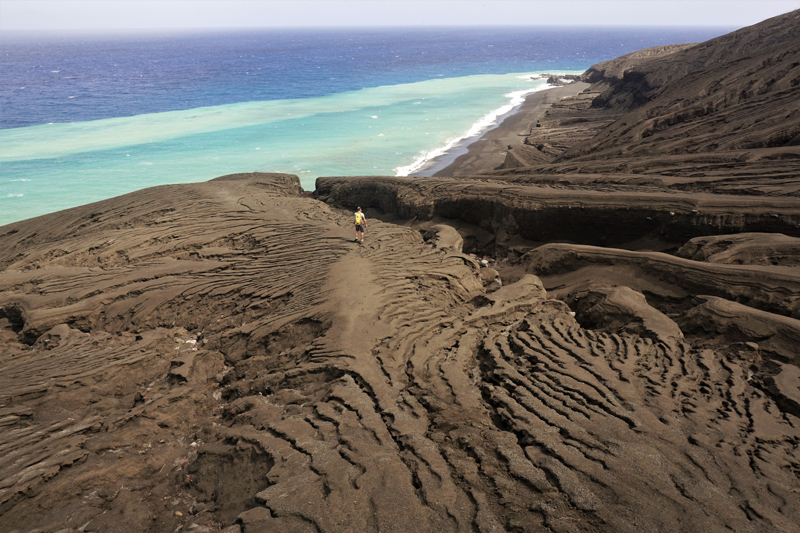 Strong rilling and gullying of the fresh volcanic material making up the new island that abuts Hunga Ha‘apai underscore the rapid rate of erosion in the area. Coastal erosion has cut into the initial posteruption shore by more than 500 meters, leaving 40-meter-high collapsing cliffs on the island’s south side. Author Shane Cronin stands near a large gully. In the 2.5 years since its formation, the primary volcanic cone lost about 40% of its original footprint, which spanned roughly 8 square kilometers. However, the island has remained roughly the same in overall area because erosion has been matched by long-coast redisposition of the volcanic material in beach bars, altering the island’s shape. Shortly after the eruption, we carried out a photogrammetric survey using a drone and real-time kinematic GPS control points to provide a baseline for future monitoring. We collected samples to chemically characterize the new volcanic material and compare it with deposits of the broader volcano. On the older Hunga Ha‘apai islands, we found welded pumice-rich ignimbrite units and nonwelded pyroclastic flow deposits, laid down by superheated flows of gas and particles. Such deposits attest to past huge explosive eruptions from this long-lived volcano. One pyroclastic flow deposit contained charcoal, which we dated to the period 1040–1180 CE. This deposit correlates closely in age and chemistry to ashfall deposits found on Tongatapu Island, 65 kilometers to the southwest [Cronin, 2015]. It also corresponds, within uncertainty bounds, to an unknown tropical eruption in 1108 CE that produced more than 1°C of global cooling [Sigl et al., 2015]. We also mapped the seafloor surrounding the new island at a resolution of about 1 meter using a WASSP® multibeam sounder. Fig. 2. 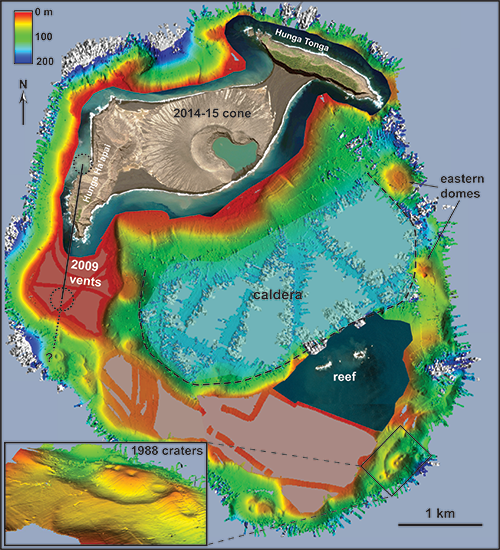 A bathymetric sonar survey of the seafloor near the islands of Hunga Tonga and Hunga Ha‘apai, conducted in November 2015, shows the summit platform of the submerged Hunga volcanic edifice. The dashed black line outlines a previously undocumented caldera, which lies 150 to 180 meters below the surface. Traces of past eruptions along the caldera rim are clearly visible; the inset gives the locations of the 1988 eruptions in greater detail. Areas colored white represent depths greater than 200 meters, beyond the range of the sonar system. The seafloor survey revealed a large closed depression to the south (Figure 2), consistent with the caldera postulated by Bryan et al. . The depression is approximately 150 meters deep and measures about 4 × 2 kilometers, with its northern and southern portions filled by younger volcanic deposits. A broad, shallow area is associated with the 2009 eruptions south of the island formed in 2015 and a chain of cones formed in 1988 to the southeast. Numerous other cones surround the rim of the caldera. The caldera likely formed when an older Hunga edifice collapsed violently into the sea. This collapse may be the source of the unknown South Pacific eruption about 1000 years ago. Our first observations highlight how rapidly new volcanic forms are eroded in this area and imply that the volcanic record in the Tonga region is extremely fragmentary. In future visits, we will continue investigating past eruptions while extending submarine surveys and sampling around the new island to monitor the ongoing changes in response to storms and other events.